We were doing an investigation at St Giles Churchyard in Birmingham U.K. as we were taking the pictures we came across this strange mist on a few of the pics but not all of them. This churchyard dates back over 1000 years. 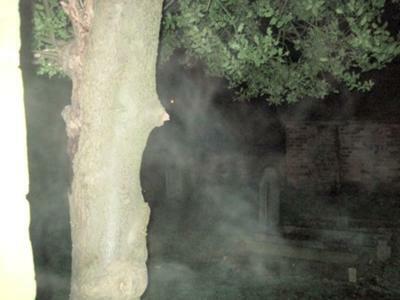 To the right of the tree you can just make out the outline of a lady, she seems to be sitting down... we will be continuing our investigation of the churchyard so keep your eyes open for any future pictures. I would love to have your comments on this picture please. There IS a lady in the mist. She either looks like she is singing, or has her mouth open. But she is def. there! if you look right in the middle of the picture, you might be able to see her eye. Then if you look even closer, you can see her black hair. She's there! Nice photo, by the way. I was there and believe me there wasn't any smoke visible to the naked eye but I can see what you mean. Hi there guys. Thanks so much for all your comments. I can fully understand that it looks like smoke. I can reassure you all that no one was allowed to smoke on the investigation, so we can rule that out. As for it being from a grill, we were in a graveyard so that wouldn't be an option. we never witnessed the mist with the naked eye, it was only when we looked at them on the computer that we saw it. The picture's have not been enhanced in any way, they are as you see them now. we have loads more like this from the same place. all in all it was a great but scary night.. Gewt in touch if you would like to see more. Hi, I am a ghost hunter, and professinal, and yes it looks like smoke, BUT it is mist, and don't you see the faces?! Theres one in like the a little up from the corner, and another one that kinda looks like the brick thing in the back, but is not, cause I see an eyeball on that face. So whoever got this amazing picture, probaly meant "ghost lady(s) in the mist"
Well, it's a cemetery so I think we can rule out smoke from a smoking grill, as it would be prohibited. Would you agree, Brenda? Secondly, there are several images within the mist, so I would vote for something paranormal. Haha You're like kids looking up at clouds. Not to be a killjoy. This stuff is interesting but this one does not seem like a realistic sighting. If you think about it. Is that a child ? Neat photo! What really got my attention though was not the lady ghost which is interesting enough.. It's what appears to me to be a small child on the right side of the photo! Maybe a girl say not quite in the double digits age-wise and wearing what appears to be a heavy garment. Like one of those big wool 3 button down types. I'm not familiar what the lady's call them.. Sure looks like a kid out of an old time photo to me! What about the spirit standing up by the tree? You have more than one there. She almost looks naked? Coool picture, quite scary. I accepted your photos because I am interested in your investigations. The only thing is . . . this pic looks like smoke to me. Maybe not cigarette smoke, but smoke from a grill or something. lol. It does not appear to be paranormal. However, our visitors may have other opinions. . .
© ghostsandstories.com. All rights reserved.